My new horticulture YouTube channel extends my gardening education into another realm of social media. Videos are the latest social media trend, with predictions that 74% of all internet traffic in 2017 will be video. My plan is to produce short, informational videos covering a wide variety of gardening topics and more. I post the videos on my ILRiverHort Facebook, Twitter, Pinterest, Instagram, and other blog sites. They will also be included in future educational programs and webinars. My first video "2017 Horticulture Program Outlook" shared my vision for the University of Illinois Extension, Fulton-Mason-Peoria-Tazewell Unit horticulture program. The video highlights my goals to continue building on our already successful program, support current volunteers, and introduce new innovative ways to reach new audiences. 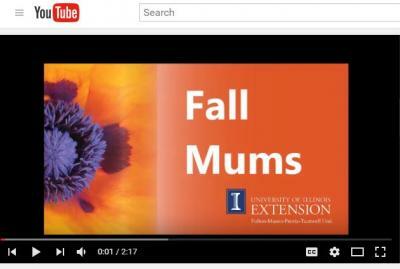 To date, the first eleven videos received 393 views, with "2017 Horticulture Program Outlook" and "Planting Fall Mum" receiving the most views. According to YouTube analytical data, these videos reach a majority of male viewers, which contrasts my other social media sites. Interaction with viewers occurs primarily when videos are posted through Facebook and Twitter. In addition to specific questions, positive comments include: "Nice," "Great video" and "You make it look easy." For the most part, I use my own backyard to film clips used in the videos. I consider my backyard a horticultural laboratory where I can do what I teach, and teach what I do. My videos provide quick summaries of a particular topic and what the home gardener can do. Each video begins and ends with guitar music played by me. The end of each video provides a University of Illinois Extension website link to more information, as well as links to my ILRiverHort social media sites. Extension has a reputation of providing the most current information in ways that reach people where they are. Videos offer gardening tips and ideas to help people grow their own food and enhance their landscapes. These videos provide trusted information in a complicated world of garden videos, websites, magazines, and television shows. View these videos at http://go.illinois.edu/ferreevideos.